Devoid Of Culture And Indifferent To The Arts: Recipe: Barbecue Weekend? How about making Mustard! Recipe: Barbecue Weekend? How about making Mustard! It’s time to fire up the barbecue and slap on some burgers, hot dogs and steaks. So what are you going to slather on top of these mouthwatering creations? Mayo, ketchup relish and/or mustard, of course! Making any homemade condiments may seem a bit daunting or mysterious, but they’re actually not. It’s fun and can help cut your shopping costs down by not purchasing the prepared grocery varieties. Not only will you have more control over the chemicals, dyes and preservatives that your family ingests, but you can also create combinations of flavours that you just can’t find in the store. In the case of mustard, if you factor in varied ingredients like yellow mustard seeds, brown mustard seeds, either fine ground or coarse, special flavourings, etc., you can see there isn’t much of a limit on what you can do in making homemade mustard. Whatever the combination, specialty mustards make wonderful gifts. Purchase whatever interesting jar or crock you wish (which then becomes part of it), show a little creativity in your recipe and you will have a unique and impressive gift. Mustard is also a thoughtful gift as it is low in calories, unless you add honey or brown sugar, for example. Making mustard requires nothing special in the way of equipment, except for perhaps a grinder if you’re making mustard from whole seeds. Just remember, mustard should never be made or stored in aluminum. It causes oxidation of the surface. A word of caution. Homemade mustard is NOT yellow hotdog mustard. It is spicy. If you like yellow mustard perhaps you had better go to the corner store… If you can get past the natural spiciness (which isn’t too bad), it’s delicious. Another word of caution. The colour of hotdog mustard is because of food dye additives – which aren't very good for you. Some commercial brands do colour their mustards naturally with turmeric. Homemade mustard is not Day-Glo yellow like French's© mustard. You won’t get that colour, so don’t try. Mustard’s initial “pungency” does mellow somewhat as it ages. Making mustard from powder is almost an instant gratification thing. 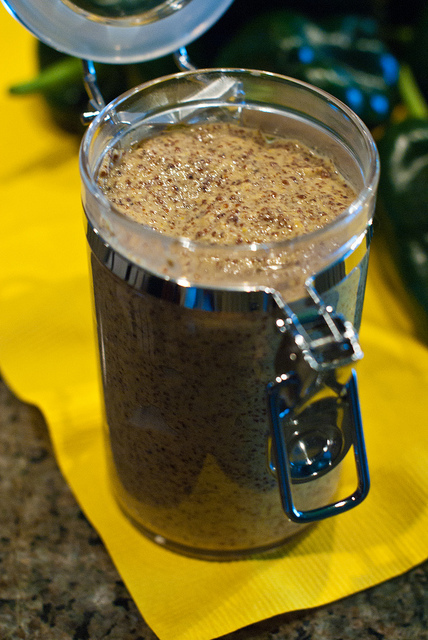 Making mustard from the whole seeds is a bit different as the seeds should be toasted, soaked and then ground. Mustard from seeds tastes much better after it has "ripened" for a few days. You get a far better melding of flavours after aging. Mustard can be flavoured with almost anything. 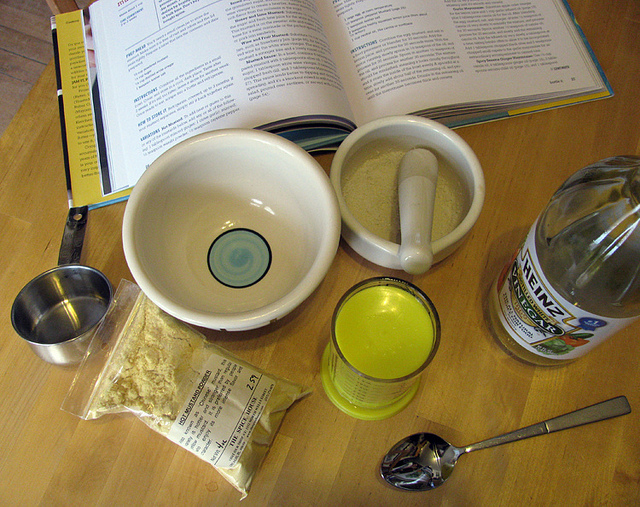 The basics are mustard (seeds or powder) and water, although other liquids can be used. After that it’s actually up to you. Sage, thyme and honey, apple, sun-dried tomato, beer – you name it, you can add it in. Making mustard can be a real benefit. You only really need to make whatever amount you need for what you’re doing. 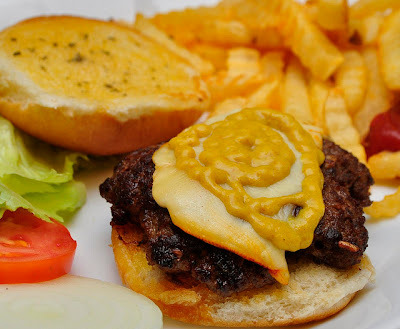 For example, if you’re having a barbecue with fruit salsa or fruit salad you could use some of the same juice or fruit in your mustard for on your burgers. If you only make 1/2 cup of mustard it’s not a lifetime investment. Save money. Buy in bulk. If you intend on making a lot of mustard (by that I mean a few cups) you should either purchase powder or seeds from a bulk foods supplier. In Nova Scotia we have The Bulk Barn. Purchasing powder or seeds at a grocery can be extremely expensive. I know first-hand. The recipe makes about between 1 to 1/2 cup of mustard but the recipe is easy to scale up or down. This is a no eggs version so you can feel safer storing it in your refrigerator. The usual binding method in mustard recipes is egg, but egg substitute can be used. This recipe replaces egg "binder" with flour. 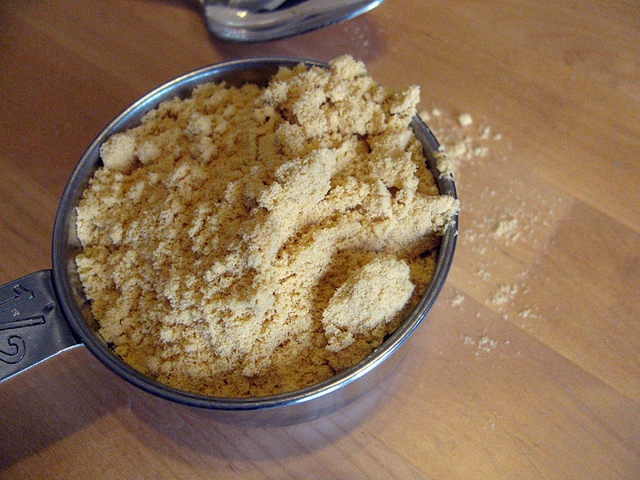 Mustard powder (sometimes called mustard flour). 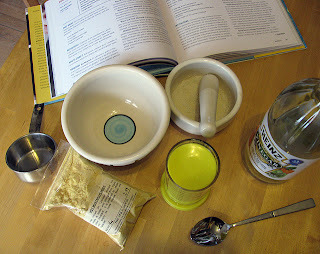 Combine the dry mustard, flour and cider in a saucepan. Whisk until smooth. After it has cooked and thickened, remove from the heat and let it cool, covered. After cooling, stir again and then place in a jar or jars and refrigerate. The flavours will mellow and blend more after sitting for a day or two.